Tulsion MB-115 is a mixed bed resin of strongly acidic cation exchange resin Tulsion T-46 in Hydroegn form and strongly basic type 1 anion exchange resin Tulsion A-33 in hydroxide form in 1:1.5 volume ratio. Tulsion MB-115 is designed for use in final polishing for production of ultra pure water. TULSION MB-111 is a slightly lower spec resin than MB-115 and is value for money. Suited for final polishing after R/O. 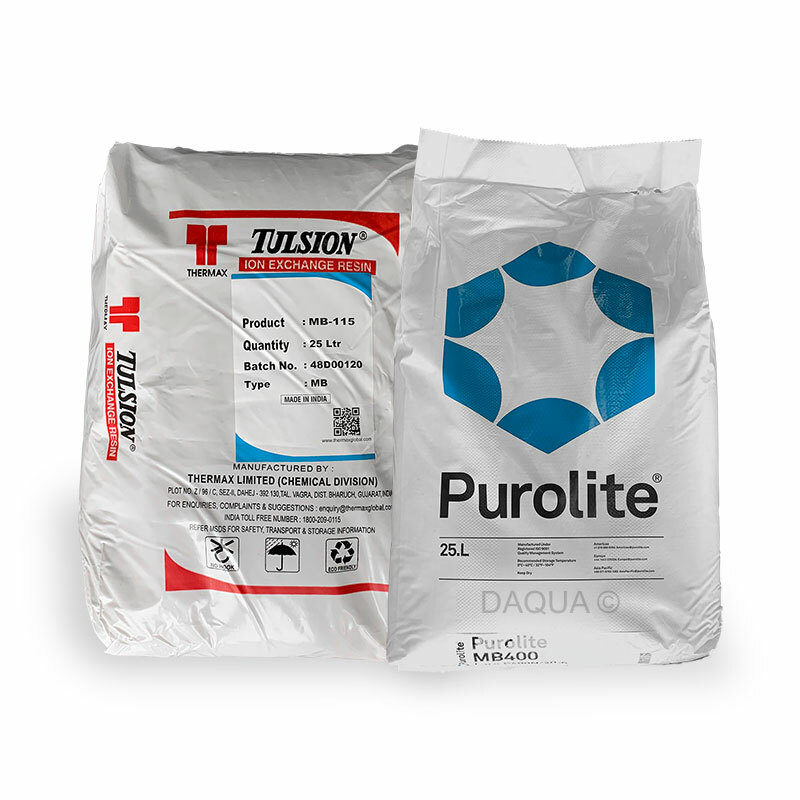 Purolite MB400 is a high quality resin mixture for direct purification of water. It is suitable for use in regenerable or non-regenerable cartridges and in large ion exchange units. Can be used for window cleaning and car valeting. Nuclear grade mixed-bed DI resins are used for the production of ultra-pure water, ensuring that the water treated is of the highest purity possible. Manufactured from strong-base type 1 anion and strong-base acid cation mix, the NRW3240 (formerly NRW37) resin ensures that the water processed is of highest quality 18.3 megohm resistivity, or 0.055 microSiemens/cm conductivity. © 2019 DAQUA Limited. All rights reserved.